Awesome story!! Filled with emotion it had me crying, laughing, and awwwing all over the place. The dynamics between Cherry, Taylor, and Sam are beyond heartwarming and I was cheering for them to find their HEA all the way through the story. Cherry's family and the nastiness they brought just had me angry! As with any good romance though, love can get you through the toughest times! I just love this small town series and can't recommend it enough and if you haven't read the first one in the series (they are both completely standalone) I recommend that one too! Cherry Hill's life is a disaster. First Taylor Johnson, her first love in back in town. Second, a fire has forced her to shut down her diner and has left her temporarily jobless and homeless. Third, her cousin, who was her best friend and like a sister has died in a car crash leaving Cherry the sole guardian of her 8 year old son Sam. And lastly the rest of the Hills are determined to take Sam away from her. Now she must do everything in her power to prevent that from happening and she finds a surprising ally in Taylor. But there is a painful past hanging between them and a secret that only she knows. I loved they way Sam holds it together and is so mature for an 8 year old. The way he identifies with Rex and opens up to Taylor is so sweet. It was a bit frustrating how Cherry was stubborn about not sharing her secret but then I guess the book would have ended a lot sooner if she did and I was quite enjoying it so that would have been a downer. I hope we get more in this series. Would really love to have a book on Stan. ARC provided in exchange for an honest review. A second chance romance, with two characters that have matured since their earlier days. Cherry has had the worse day of her life, her diner caught on fire and then to find out the her cousin and her husband has died in a car accident and has left Cherry guardian for their son, Sam. 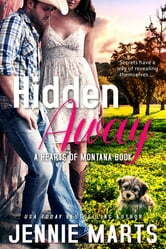 To top it off, her high school flame, Taylor has returned to Broken Falls, Montana as the new town sheriff. The chemistry between Taylor and Cherry is hot. Cherry has a big secret that she has kept from Taylor since he left town nine years ago. This book kept me turning the pages. Love the small town atmosphere of how the town comes together helping Cherry. Cherry has become a very strong person, she works very hard for what she has. Plenty of drama and emotions, keep your kleenex handy. Loved Sam and Rex. I received this book from netgalley for an honest review. Marts takes small town romance to a new level with this novel. She sets the scene well, lending itself to the intricate story of the characters’ lives. I enjoyed how Marts takes the general form of a second chance romance but gives it a twist, making it all her own. I enjoyed the way that Marts combines a second chance romance with a new start for her characters. It was a unique mix that lent extra complexity to their lives. Marts developed their personalities individually, creating two extremely well rounded people that I loved getting to know. At the same time, neither were perfect. I enjoyed the jagged edges that Marts not only leaves, but actually points out in her characters. It made them so much more real. This was a fun and emotional second chance romance that I thoroughly enjoyed. It was my first novel by Marts, but it won’t be my last. Please note that I received a complimentary copy of this work in exchange for an honest review. The engagement was supposed to be fake, but it doesn’t take long for Taylor Johnson’s pretend feelings to become real for both Cherry and her adorable nephew, Sam until a secret threatens to tear them apart in this captivating romance. Cherry Hill is now the sole guardian of her nephew and with the upper crust of the Hill family trying to take him away, she has no choice but to accept the help of the man who broke her heart and the reader can’t help but get pulled into the story as Taylor and Cherry begin to form a new family. The chemistry between Cherry and Taylor is a smoldering inferno of heat but this relationship has quite a few issues, like trust, secrets and the past that adds lots of emotional turbulence that captures the heart. Strong compelling characters are easily related to while the fast paced, smooth flowing plot captivates readers with suspense, turmoil and romance. Expectation builds throughout the story as the reader waits for the other shoe to drop because of Cherry’s secret that she’s been hiding and tension builds as Cherry’s family connive to take Sam away from Cherry in any way they can. The well written scenes and details bring the story to life making it easy for the reader to get caught up in the exciting events as they are drawn farther in to the story. First, let me start off by saying that I have not read Tucked Away…yet, but that did not stop me from enjoying Hidden Away so it can be read as a stand-alone story although it does mention bits and pieces of the events in the previous story, which has enticed me to read it, especially as the Broken Falls, Montana town is a small community that looks out for each other, so I can’t wait to visit again.